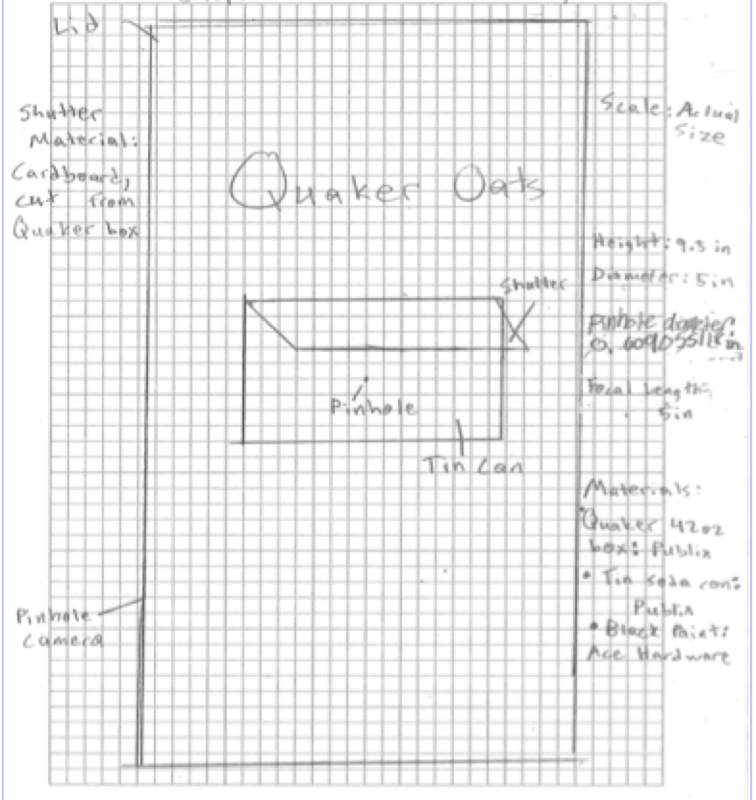 I asked for a scaled blueprint with dimensions and got this. 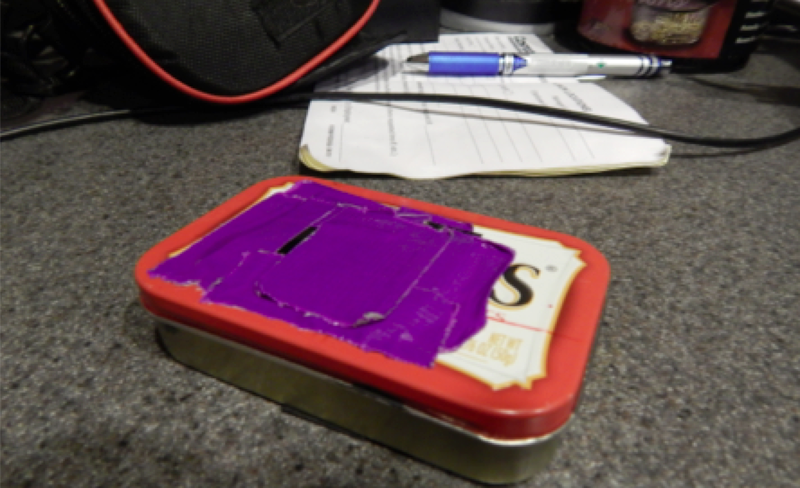 It’s a pinhole camera made from a oats container, in case that wasn’t obvious. While getting ready to report for planning days (we call it Faculty Forum at my school), I ran across this Evernote note: Tech Skills to Explicitly Teach in 2014-15. Every one of these items bugged the hell out of me last year. Then I realized no one’s ever taught them these skills and it’s appropriate to learn them in freshman year. As you read my list, what would you add? Remove? Remember, these kids are freshmen in a school with 1-to-1 laptops. Taking good photos and drawing good diagrams for technical papers. Cause this Quaker Oats crap above isn’t cutting it for me. Dem backgrounds distract me in photos. They couldn’t be bothered to clear the counter off before taking the photo? Technical drawing 101: Dimensions on diagrams, front/side/top views as necessary. Correct & quick MLA formatting. Math Stuff because I’ve seen enough “sqrt” as below. Writing equations in a word processor. What freshmen will type to avoid learning the equation editor or where the insert > symbol menu item is. The list is ambitious but I believe this set of skills to be infinitely useful. We write our first research paper on the physics of musical instruments in September. Homework: What would you add to my tech skills teaching list? Remove? Remember, these kids are freshmen in a school with 1-to-1 laptops. Make sure you warn them about the perils of the equation button! OMG, just read your blog at http://www.megcraig.org/?p=14. “The equation button in the ribbon is VERY tempting, like a man with candy in the back of a van. DO NOT GET IN THE VAN.” Can we be friends based solely on this quote? Plus, I heard about your Twitter Math Camp presentation on equations from something like 1000 miles away, it was that good. Aw, thanks! We can totally be geeky snarky BFFs! How to attach and send documents through email instead of retyping them in the email itself. How to resize pictures so they aren’t stretched out all stupid or blurry. Keyboard shortcuts for copy, paste, cut, and undo. How to make PowerPoint slides advance automatically and add music. And when it comes to PowerPoint in general, LESS is more. These are excellent! I especially love “How to resize pictures so they aren’t stretched out all stupid or blurry.” Yes! Thanks for the ideas. Maybe I’ll generalize from the attachment suggestion to “9th grade email etiquette” — my kids know how to attach stuff but totally forget they’re talking to a teacher when they email me. Yes, you do have more than 140 characters in an email. Use them. Also get a free email that is as close to your name as possible and use it for professional emails. It’s hard to take “sparkles4ever98” seriously. Also use font choice for papers, posters, power points. Down with comic sans! As an added bonus, maybe how easy it is to make invites and such with word or PowerPoint? A fun skill that can save them money later!